MSBuild is the default build engine in the .NET world, but if you do more with MSBuild you will find yourself in a XML-mess, so that’s the reason why I tried out FAKE. You can find a couple of MSBuild related posts here. Our goal: Building, running tests, package NuGet Packages etc. The next important line is the RestorePackages()-line. With this line all NuGet packages will be restored from NuGet.org or your own NuGet-Repository. If you check-in your NuGet packages then you don’t need this. The first target cleans the artifactsDir via the FileHelper. The next one is responsible for calling MSBuild (which builds the actual project) (via MSBuildHelper). This is maybe the most awkward part of the build script for a C# dev, but this “pipelining” is part of F#’s nature. I can’t explain it right now, but it works (I didn’t lie when I said that I have not a tiny bit of knowledge about F#). 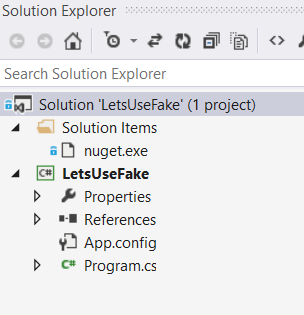 ".nuget\NuGet.exe" "Install" "FAKE" "-OutputDirectory" "packages" "-ExcludeVersion"
First we need to load FAKE via NuGet and after that we invoke our build.fsx file with Fake.exe. Now you or any build machine can invoke the batch file and start the build!